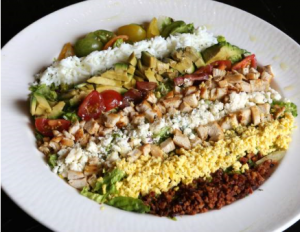 The Classic Cobb salad; a refreshing meal in itself to gear up for summer and all the good times that come with it. Enough for 4 to enjoy. Season chicken breasts with salt, pepper and garlic, baking at 350 degrees until done. This can be done prior to dinner if you prefer warm chicken or ahead of time if you prefer chilled. Place lettuce in a bowl and in a separate bowl, mix dressing ingredients thoroughly. Check the balance of the dressing for flavor and if needed, adjust accordingly. Peel and cut hard-boiled eggs in half, removing yolks from the whites. Fine chop each separately, resulting in a pile of yolks and a pile of whites. Mix dressing into lettuce, tossing gently. To assemble salads, place equal portions of lettuce on 10-inch plates and about 1/2-inch deep. At the top of the salad (12 o’clock position and working down the center to 6 o’clock position), place a row of tomato. On the right side of the tomato, again from top to bottom, place bacon. To the left of the tomato, place the chicken. Now on both the right and left sides of the salad, place crumbled cheese (two strips from top to bottom). Then place egg whites on the right side and egg yolks on the left side, followed by a thin line of green onion on both sides, finishing the assembly. Spring screams for a new vintage rose (2014-2015), which should be rolling into local wine outlets, as the perfect pairing. Add a beautiful sourdough bread, and you’ve got the perfect meal. Enjoy!